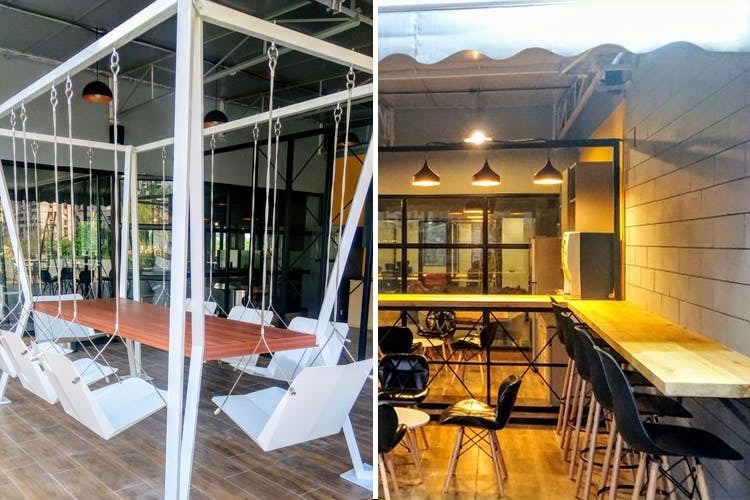 WorkAmp Spaces has launched its recent co-working space in Andheri East. The first among the series of office spaces that are planned to be opened in Mumbai, this one is spread across a total area of 10,000 square feet with amazing amenities to induce a fun and productive working environment. Out of 10,000 square feet, the newly launched centre boasts of a 3000 square feet terrace garden to unwind with 300 feet all round gallery. The place can accommodate around 200 people. They also have a trained concierge service to cater to the individualistic needs of each customer, which will ensure flawless meetings with clients along with uninterrupted and smooth conferences. Decked up with pinewood tables and metallic ergonomic chairs, the space makes for a very comfortable place to work. Also, don’t miss their swing conference room for an open meeting experience which will make the boring meetings a little quirky. You can get a seat here starting at INR 7,000 upwards, basis you requirement. They have individual desks, private cabins, rectangular cocoons, etc. This cost is inclusive for 24X7 access all days of the week, with Wi-Fi, refreshments, hospitality etc. They give prices on request for bespoke customised office. With this launch, WorkAmp spaces now has a total of 3 centres in the city. So, if you are a freelancer or your small team is looking for a cool place to set up, you know where to head.